Group wielding 29 shovels ceremoniously broke ground at center for the arts. 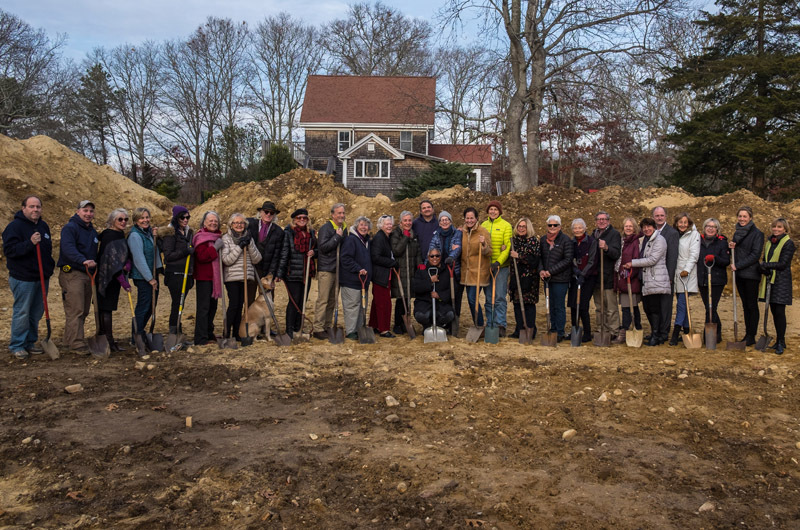 There were 29 shovels on hand at a groundbreaking Tuesday at Featherstone Center for the Arts in Oak Bluffs. The day was cold and the ground hard but members of the Featherstone community — the board, advisors instructors and representatives from the contractor, Squash Meadow — rolled up their sleeves and dug in deep to move 29 shovelfuls of earth to ceremoniously get things started. Presumably the backhoes and front loaders will have an easier time with the winter earth. Last July, Featherstone received an anonymous $2.89 million donation, part of which will be used to expand the arts campus to include a new pottery studio and a much larger art barn. Demolition of the old barn and a mildewed caretakers cottage has already taken place. The center anticipates the arrival of the modular pottery studio in early January and it should be functional by April or May, Ms. Haeger said. The art barn is projected to be finished in August. A formal ribbon cutting is planned for the summer, when the facilities are ready to open. Fundraising continues, Ms. Haeger said. More information can be found at featherstoneart.org. CONGRATULATIONS! thank you to featherstone for all you do for art and the community. heres to a wonderfully art filled 2017. Thank you Featherstone!! Can't wait to work in the new pottery studio! Happy New Year to you all!